For the month of August (and into November) we take an interlude to a mansion high atop a hill, with thousands of mirrors looking inward… the towers of Inverness! The original Fourth Tower of Inverness is the classic mystical trans-dimensional journey which brought ZBS to the ears of a generation of listeners. 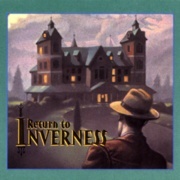 We have the distinct pleasure of featuring the second installment of the series, Return to Inverness, set some years after Jack Flanders started his mystical journeymaking and spiritual globetrotting. Upon the death of Lady Jowls, Jack finds himself back at Inverness, having inherited a generation of kooky inhabitants and dazzled by the mysterious that still remain. Oh, and Captain Radio is here with a review of Camino Real Productions’ The Mesmerist.